ASYA Design Partner is determined to perform with excellence and strives to be the best in its craft not only by producing innovative concepts, but also by having a sound mind and body. With this as a general directive, ASYA introduced ASYA CUP – an annual badminton tournament comprised of business allies who have showed their unwavering support to ASYA Design. These include developers, suppliers, consultants and ASYA employees who vie for the championship trophies. 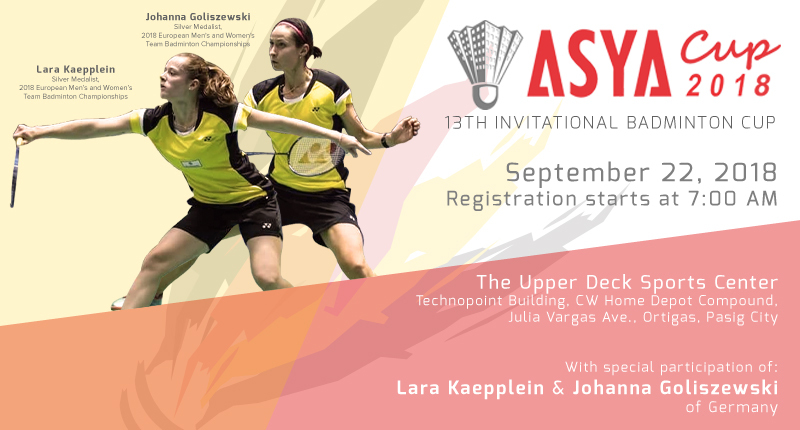 This year, ASYA Design Partner has been overwhelmed by the outstanding performance of their import guests, namely Johanna Goliszewski and Lara Kaepplein in the Exhibition Game that was held at The Upper Deck Sports Center, Julia Vargas Ave., Ortigas, Pasig City on September 22, 2018. We’d like to thank all our loyal partners, dear clients and all the participants for this year’s successful run. We hope to see you guys again next year! For more information about the happenings of ASYA Cup 2018, click here.